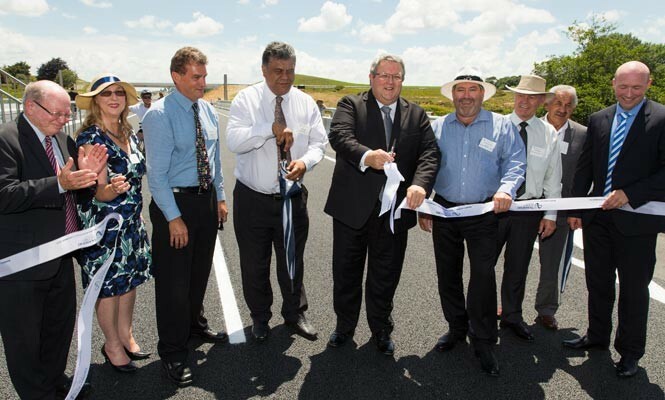 The new 12.3km section of the Waikato Expressway was officially opened by Transport Minister Gerry Brownlee on the 16 December. Minister Gerry Brownlee, local authority figures, and Waikato-Tainui iwi group joined the NZ Transport Agency to officially open the new 12.3km section. Around a thousand members of the local community attended the official ceremony which ran from 11.30am to 12.15pm on ‘Te Rehu o Waikato’ (the mist of Waikato), the new 142 metre bridge across the Waikato River near Horotiu. The public were able to walk and cycle across the Ngarauwahia section. A separate opening ceremony was also held for the opening of theTe Awa River Ride cycleway. The section bypasses Ngaruawahia and stretches from Taupiri in the north to Horotiu in the south. The road was then open to traffic on the 16th December. Fletcher Construction was the main contractor to the NZTA on this project. Higgins is the specialist pavement and surfacing contractor to Fletcher Construction. Photo courtesy of the NZTA.